I’m finding that the transition during the time you lose your parents is almost surreal. They are still so close in memory that it is almost as if they are not really gone. Sometimes I think I hear my mom whistling, as if she were standing at the kitchen sink with Harry the canary singing harmony with her from his cage just a few feet away. She was known around our town as, "The Whistler." As we were going through mom and dad's things it brought out great memories for all of us, but what touched me most was how certain seemingly unimportant objects held great emotions for our kids. It made me realize that they held those important feelings for their grandparents that we possess. Each one of them had as much quality time with grandma and grandpa as they wanted or needed. My parents called their property "The Ole E Ranch" and it was always a welcoming place. Anyone could drop in and feel like they were expected. It was just a 60's model mobile home, but in a beautiful wetland setting. Friends would say, "They live in a palace." And what made it a palace was not the place, but the occupants. I would be remiss if I did not mention the fact that mom was famous for her chocolate chip cookies. My brother Tom is in possession of the glass cookie jar with the green tin top that could not be quietly opened. And believe me we tried. Kids are different today. When we were kids we never used doorbells, we would always go to our friend's door and yell their name— "Donnie." It was very efficient. You never got the parents or an older brother, who was just gonna slug ya anyway. The person you wanted always showed up at the door. But kids would come to our house and yell—"Bea." They didn’t want Tom or I— they were at the door begging my mom’s cookies—she would always give them some, which only encouraged them to come back. My mom played many roles in the parenting scheme of things. Tom and I found out many times that Bea and Ernie worked together. Ernie would yell at us, but when things got out of hand he would send the 5 ft. enforcer in to quell any riots that might be going on in the upstairs bedroom. She was always famous for saying, "I’m little, but I’m mighty." One time she came up to straighten us out and Tom and I tied her up and told her she was "mighty little." We paid for that! On the other hand she was also the peace-keeper. For example whenever she wrecked the car she would always say to Tom and I, "Now don’t tell your father." Her advice to her daughter-in-laws was advice that her mother gave her, "a little white lie never hurt anyone—it’s better than a big fight." What the girls don’t know is that she gave Tom and I that same advice. Her peace-keeping role only went so far. After all we are Irish. When most kids get into a fight in the neighborhood the parents would be out there to break it up. But my mom would be out there screaming, like Jim Bradock’ s trainer, shouting boxing jabs. She always told me I needed to use my left more. She was very athletic. When we were gathering her things we found many of her trophies from high school to senior golf and bowling leagues. I said to Tom, "Why don’t we have any trophies?" Then I remembered, I don’ t play golf, and mom could out drive Tom. She was contrast in motion. 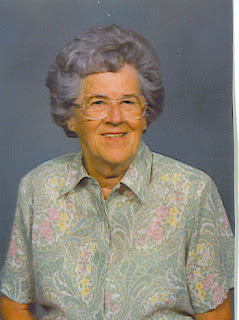 She was both a sweet, gentle little Irish lady and tougher than nails at the same time. During her few months in the Hospice program I would visit her at her home every morning and ask her how she was doing. "Fine, I feel great, NO Problems." Then "psychic" Sara would show up—our wonderful Hospice nurse, and say, "What’s wrong, Bea?" "Nothing, I’m doing great." It’s okay Bea, you can tell me." "Really, I’m fine." She quickly learned that Sara’s blood pressure and pulse readings worked exactly like a lie detector. You can’t even tell "Little White Lies" to Sara. "Okay, I fell last night and hurt my leg but I’m fine, I don’t want my kids to worry about me." For a woman that could not swim and was afraid of the water, my mom loved to fish and had four boats named after her, The HoneyBea 1,2,3, and 4. I think that might have been brilliant marketing on my dad’s part. When my folks bought an Airstream in 1957, which were known in those days as "Land Yachts," I’m surprised that it wasn’t christened "The HoneyBea" also. But it already had an Airstream Travel Trailer Club number on it, so I guess there wasn’t room. You don’t often appreciate the efforts of your parents until later in life when you reflect on all the things they fit into your youth. While we were going through pictures, my niece Tabatha was getting a kick out of a picture taken by a Michigan Bell Telephone Company magazine photographer. It was a picture of the whole family next to a 1960, chocolate brown, Buick LaSaber convertible with wings big enough to make it fly — hooked to it was our Airstream with a big red and white sign that said, "Seattle or Bust." We were headed for the world’ s fair. Tabby said it looked like my Dad had this big smile and wave, like — "Hooray, we're going on a great adventure." She said my brother, Tom, her dad, looked like he had his hand up as if he were at that age when — "I’m too cool to wave" — even our collie Duke had a big smile on his face. But Tabby said she thought my mom had that look of — "Oh boy, here we go again ! " But if she did feel that way you would never know it. She was a trooper, always game, always fun, always kind, always encouraging. She was capable of her own adventures. She always wanted to go to Ireland and see her mothers old homestead. When she was taking Chemotherapy she told us, "If I go into remission I’m going to spend your inheritance and I’m taking the whole family to Ireland." And by golly that’ s exactly what we did. To the Emerald Isle went her great granddaughter Lexi, her grandchildren Tabatha, Kevin and Maggie, my brother Tom and his wife, Chris, Gaila and I — and even though she wasn’t feeling up to par mom was sitting right in the front of the bus leading the charge across Ireland. Of all the stories we will have to tell through the years about that trip one of my favorites will be when she, and her oldest son, and her grandson closed down a pub in Bunratty called Dirty Nellies and had to drag themselves back to the Bed and Breakfast and knock on windows until they found someone they were related to — to let them in. My memories will always be highlighted by her deep faith. Even toward the end when she needed help to get ready for bed, before she would climb in, she would still drop to her knees and say her prayers. She prayed us through many of the peaks and valleys of life. On our many adventures when I was a kid we never missed church. On Sunday morning, it didn’ t matter if we were in the middle of Wyoming or the wilds of Canada — we went to church. Fishing camp in Canada was the one I remember the most. There was a traveling priest who covered several churches, so he didn’ t hold mass near us until mid-afternoon. It was great because we could fish all morning. But after lunch she would make us get cleaned up and off to church we would go. It wasn’ t that far. I think the church was in Quebec — and we were only one Province over, in Ontario. If you ever hear me talking about my mom or my dad, or any of my grandparents for that matter, you might get the impression they were perfect. Well — they were!